Cordao de Ouro (“Belt of Gold”) is one of the largest Capoeira associations in the world. It is headed by Mestre Suassuna who founded the group in the 1960’s. Within the association there are numerous sub-schools and groups led by Mestres who have forged their own style and methodology. Our group is supervised by Mestre Papa Leguas (“Road Runner”) who is based in Patos de Minas, Brazil. 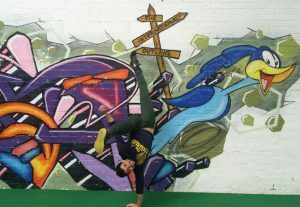 He has a relaxed and technical style of capoeira that incorporates a spectrum of Angolan, Regional and Contemporary elements. Mestre Papa Leguas began capoeira when he was 14. Originally with Grupo Afro but then with Cordao de Ouro under Mestre Ze Paulo (Belo Horizonte). He moved to the UK in 2000, and in 2001 started a group in Nottingham. He opened the first UK academy in 2004. Contra-Mestre Adam began training with Mestre Papa Leguas in 2002 and within a couple of years was helping with beginners and children’s classes. Mestre Papa Leguas moved to Crete in 2008 and started a group in Heraklion. He briefly returned to the UK (Norwich this time) in 2011 before starting up a group in his hometown of Patos to Minas. He works full time as a capoeira teacher spending many months abroad visiting his groups across the world.